Hajj, the annual pilgrimage to Makkah (Mecca), in the Kingdom of Saudi Arabia (KSA) is one of the largest gatherings of its kind in the world. Performing the rituals of the Hajj and Umrah is demanding and often involves walking long distances in hot weather. Pilgrims must ensure that they are as physically fit as possible. All pilgrims who intend to undertake Hajj or Umrah and seasonal workers, are required to provide proof of vaccination against meningococcal ACW135Y, vaccine administered no less than ten days prior to arrival in KSA in order to obtain a visa for entry . The KSA Ministry of Health (MoH) currently recommends that, as a precautionary measure, pregnant women and young children, should postpone the performance of the Hajj and Umrah . Those with severe medical conditions such as terminal cancers, advanced cardiac, respiratory, liver, kidney diseases or senility are exempt from these religious duties . Influenza is easily transmitted in crowded conditions. Where travel cannot be avoided, pilgrims in clinical risk groups for influenza should receive influenza vaccine annually from their usual healthcare provider, when available, as this may still confer some protection for the upcoming Hajj. This year Hajj takes place just before the new winter season influenza vaccine for the northern hemisphere becomes available. Due to the large crowds, mass gatherings such as Hajj and Umrah are associated with unique health risks . Each year, in early summer, the Ministry of Health (MoH) of the Kingdom of Saudi Arabia (KSA) issues the requirements and recommendations for entry visas relevant to pilgrims and seasonal workers who intend to visit KSA during forthcoming Hajj and Umrah season. Requirements and recommendations may differ from year to year. The requirements and recommendations for the 2018 season are now available on the KSA Ministry of Health website . Hajj, the annual pilgrimage to Makkah (Mecca) in KSA occurs between the 8th and 12th day of the twelfth month of the Islamic calendar and is one of the largest mass gatherings in the world. Approximate dates for the 2018 Hajj are 19 to 24 August . Every year approximately three million Muslims from around the world gather in Makkah for Hajj. All adult, able bodied Muslims are required to undertake Hajj at least once in their lifetime if they can afford to do so . Umrah is a shorter, non-compulsory pilgrimage for Muslims, which is performed as part of the Hajj ritual, but can also be undertaken at any time. KSA is likely to be more crowded during the month of Ramadan, which takes place in the ninth month of the Islamic calendar starting with the sighting of the crescent moon  In 2018 Ramadan started on 15 May and is due to finish on 14 June . Travel health advice for KSA can be found on our Saudi Arabia Country Information page. The information on the country page should be tailored to individual pilgrims and seasonal workers. Pilgrims should research their trip well in advance of travel by checking the information on pilgrimage to KSA at KSA Ministry of Health website. Pilgrims should also seek advice about the health risks for any travel that may be undertaken either before or following Hajj or Umrah. Information on health risks for other destinations throughout the world can be found on the Country Information pages. Pilgrims should ensure they are up to date with all routine immunisations, and ideally see their healthcare provider at least four to six weeks before travel for advice on vaccinations, malaria chemoprophylaxis (if appropriate for travel before or after the pilgrimage), food and water precautions, risks from insect bites, heat exhaustion and injury prevention. Performing the rituals of Hajj is demanding and involves walking great distances usually in hot weather. Pilgrims should ensure that they are physically fit before travelling, and pilgrims with pre-existing medical conditions should discuss the suitability of travel with their doctor. If on prescribed medications, they should ensure they have a sufficient supply to cover their time abroad with some extra in case of delays, and carry a copy of their prescription. MoH KSA advises that pilgrims and relevant officials in countries of origin consider the physical ability and health conditions of individuals applying for Hajj and Umrah. Those with severe medical conditions such as terminal cancers, advanced cardiac, respiratory, liver, or kidney diseases and senility are exempt from these religious duties . In some situations deferment of travel should be considered when the risks to the pilgrim are assessed to be high. MoH KSA recommends that pregnant women and young children (pre-puberty) postpone the performance of the Hajj and Umrah rituals for their own safety . Women who anticipate their periods occurring during the Hajj may wish to delay menstruation, which is possible to achieve using hormonal treatment . Women should discuss this with their GP or family planning clinic well before departure. Pilgrims should identify in-country healthcare resources in advance of their trip, and ensure they have adequate travel insurance should they fall ill. Comprehensive travel insurance is essential for all aspects of the journey, and Sharia compliant travel insurance is available. Pilgrims should also pack a first aid kit to help them manage common issues such as cuts and grazes, headaches and travellers’ diarrhoea. Pilgrims should be up-to-date with immunisations routinely administered in the United Kingdom (UK) including measles, mumps and rubella (MMR). Information on specific health risks, including recommended vaccinations, for pilgrims to KSA can be found on our Country Information page. To obtain a visa for entry into KSA, all those arriving to perform Hajj or Umrah, or undertake seasonal work, are required to submit proof of vaccination (as a vaccination certificate) for meningococcal disease. Details of the vaccine name and type (i.e. conjugate vaccine) should be recorded in a patient held vaccine record showing the traveller’s full name. It is advisable that the proof of vaccination record is issued by the traveller's doctor, nurse or pharmacist and should reflect accurately details of the vaccine administered and be authenticated with the healthcare providers official stamp. If a traveller is in possession of an International Certificate of Vaccination or Prophylaxis (ICVP) booklet, meningococcal ACWY vaccine can be recorded in the ‘Other Vaccinations’ pages. Note that the conjugate meningococcal vaccine ‘certificate’ is valid for five years. However, paperwork must state clearly that a conjugate meningococcal vaccine was administered. If the vaccine type is not indicated, the certificate will be valid for three years. Pilgrims and seasonal workers must carry vaccination certificates with them for inspection by the Saudi Authority at port of entry. a) ACWY polysaccharide vaccine within the last three years and not less than ten days before arrival in KSA (this vaccine is no longer available in the UK). b) ACWY conjugate vaccine within the last five years and not less than ten days before arrival in KSA . This vaccine is also recommended for personal protection against groups A, C, W and Y meningococcal disease (see also recommended vaccines). MoH KSA states they may opt to administer prophylactic antibiotics to some travellers at points of entry if deemed necessary . Additional information on specific meningococcal vaccination requirements for Hajj workers and residents of Medina and Mecca for current Hajj/Umrah season is available on MoH KSA website. MoH KSA state that travellers arriving from countries with circulating wild or vaccine-derived poliovirus (cVDPV2) and from countries at risk of polio re-introduction are required to submit a valid polio vaccination certificate . Travellers arriving from Afghanistan, Nigeria, Pakistan, Myanmar, Ethiopia, Somalia, the Republic of South Sudan, the Syrian Arab Republic and Yemen should present proof of vaccination and they will also receive one dose of oral polio vaccination at the border points on arrival into KSA regardless of their age or vaccination history . All travellers arriving from the Democratic Republic of the Congo should present proof of receipt of at least one dose of inactivated polio vaccine (IPV) within the previous 12 months and administered at least four weeks prior to arrival. The UK is not a country regarded as at risk of re-introduction of circulating wild or vaccine derived poliovirus. Information on the specific polio vaccination requirements for the current Hajj/Umrah season is available on MoH KSA website. Health professionals and travellers should refer to our Country Information pages for country-specific polio vaccine recommendations and requirements. All pilgrims to Hajj and Umrah arriving from countries or areas at risk for transmission of yellow fever (YF) as per the WHO International Travel and Health guidelines, must present a valid International Certificate of Vaccination or Prophylaxis documenting YF vaccination . There is no risk of YF in the UK. Therefore this YF certificate requirement will only apply to UK pilgrims if they are travelling to KSA via a YF risk country and not if they are travelling directly to KSA from the UK. Additional information on specific yellow fever vaccination requirements for the current Hajj/Umrah season is available on MoH KSA website. General vaccination advice for travellers to KSA can be found on our Country Information page. All pilgrims should ensure that they are up-to-date with routine immunisations including measles, mumps and rubella (MMR) and diphtheria-tetanus-polio vaccine. The following vaccine-preventable diseases have particular relevance to Hajj and Umrah pilgrims. Hepatitis B virus is found in body fluids and can be transmitted either through the skin (percutaneously) or by sexual contact. Percutaneous transmission can occur through the use of contaminated medical, dental, or other instruments; all pilgrims should consider receiving hepatitis B vaccine prior to travel. One of the Hajj rites for men is head shaving. The KSA authorities provide licensed barbers with a new blade for each pilgrim. However, unlicensed barbers may not conform to this . Pilgrims should avoid shaving with a previously used blade, as this could result in transmission of hepatitis B and other blood borne infections such as hepatitis C or HIV for which there are no vaccines. Pilgrims can consider taking with them a disposable razor for personal use during this rite. Meningococcal disease may result in meningitis (infection of the lining of the brain) septicaemia (blood poisoning) and pneumonia (chest infection). 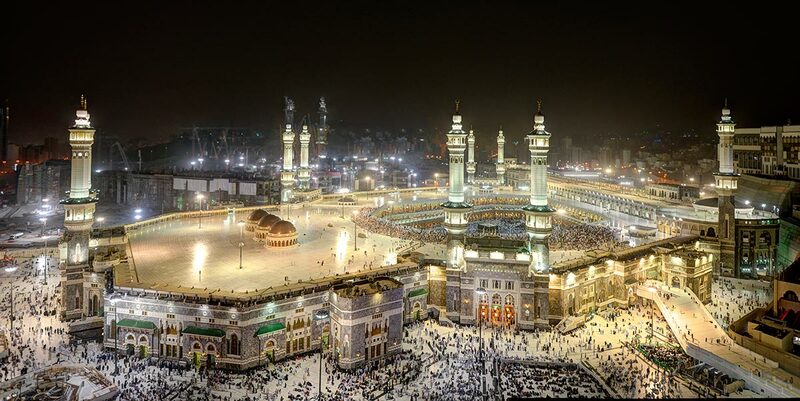 Large outbreaks of meningococcal disease, including meningitis and septicaemia, have occurred during previous Hajj pilgrimages and spread to other countries by returning pilgrims . A conjugated meningococcal ACWY vaccine is the preferred vaccine for all travellers because it not only protects against serious infection but also prevents vaccinated individuals from carrying the meningococcal bacteria and bringing it back with them. Public Health England (PHE) recommends conjugated meningococcal ACWY vaccine as the preferred vaccine in all instances. Vaccines currently available in the UK are Menveo® and Nimenrix®. Full details of meningococcal vaccines and schedules can be found in Immunisation against infectious disease (the Green Book)  and the manufacturers Summary of Product Characteristics . The UK’s Joint Committee on Vaccination and Immunisation reviewed information on length of protection following ACWY conjugate vaccine and advised that for travellers at continued risk, boosting every five years would be a sensible approach until data becomes available . These vaccines do not protect against all the causes of meningitis and septicaemia; any pilgrim who becomes unwell after returning from the Hajj or Umrah should contact their GP, NHS 111 or local hospital. There is a risk of rabies in KSA. Pilgrims should be advised of the importance of avoiding contact with wild or domestic animals and to seek urgent emergency medical treatment if any potential exposure (animal bite, lick or scratch) occurs. Pre-exposure vaccination can be considered. However, rabies vaccination prior to travel does not eliminate the need for post-exposure medical evaluation and additional doses of rabies vaccine. A three dose course of pre-exposure rabies vaccine simplifies post exposure rabies treatment and removes need for post exposure rabies immunoglobulin, which is in short supply worldwide. Influenza is transmitted via the respiratory route and through contact (direct or indirect) with surfaces on which the virus has been deposited by sneezing or coughing. It is easily transmitted in crowded conditions. Certain groups are considered at particular risk of complications from influenza. MoH KSA recommends that international pilgrims be vaccinated against seasonal influenza before arrival, especially those at increased risk of influenza complications, including pregnant women, children under five years, the elderly and those with pre-existing health conditions such as obesity, bronchial asthma, chronic heart or lung diseases, HIV/AIDS and immunosuppression. In the UK, influenza vaccine is available free for those in clinical risk groups and eligible pilgrims should receive influenza vaccine annually from their usual healthcare provider . Those who do not fall into any of these risk categories can still pay and be vaccinated at some high street pharmacies, other retailers, or private travel clinics, but vaccine not may be available in the UK summer months. New winter season influenza vaccine for the northern hemisphere is usually available in the UK from late August-September at the earliest; pilgrims planning to undertake Hajj the following year should ensure they are vaccinated during the flu season before as this may still confer some protection. Southern Hemisphere influenza vaccine is not usually available in the UK. Viral respiratory infection (known as Hajj cough) experienced by many pilgrims at the Hajj, can range from a mild inconvenience to a severe illness, and can interfere with performing the rites. Advice about influenza prevention can be found in our factsheet on seasonal influenza. Middle East respiratory syndrome coronavirus (MERS-CoV), which can cause severe illness and death, was first identified in KSA in 2012; the majority of cases to date have occurred in the Arabian Peninsula and in particular in KSA [11 - 13]. In 2017, the Hajj took place between 30 August and 4 September with no reported increase in travel-related cases of MERS-CoV. However, cases of MERS-CoV have been exported to countries outside of the Middle East  with the most recent being identified in Malaysia in January 2018. This case was a Malaysian Umrah pilgrim who visited a camel farm while in KSA . PHE remains vigilant and closely monitors developments in the Middle East and in the rest of the world where new cases have emerged, and continues to liaise with international colleagues to assess whether PHE recommendations (see below) need to change . Wash hands with soap and water or a disinfectant, especially after coughing and sneezing, after using toilets, before handling and consuming food, and after touching animals. Use disposable tissues when coughing or sneezing and dispose of used tissues in a wastebasket. Avoid close contact with people who appear ill and avoid sharing their personal belongings. Avoid contact with camels in farms, markets or barns. Avoid drinking raw milk or eating meat that has not been thoroughly cooked . MoH KSA also advises that pilgrims should wear masks in crowded places . PHE advises that travellers to the Middle East follow the advice of local health authorities. There are currently no travel restrictions in place. People who are acutely ill with an infectious disease are advised not to travel but to seek health advice immediately . Pilgrims or travellers from the Middle East who develop symptoms (e.g. fever, cough or increasing breathlessness) within 14 days of their return to the UK should seek medical advice by calling their GP or NHS 111 and must mention which countries they have visited so that appropriate measures and testing can be undertaken. PHE provides further guidance for travellers to, and returning from the Middle East, alongside more detailed information for health professionals. Diarrhoeal illnesses are transmitted by the consumption of contaminated food or water. Dehydration can occur with diarrhoea and is of particular risk in hot weather. Babies, infants, the elderly and those with chronic medical conditions are more vulnerable to dehydration. All pilgrims are advised to take personal, food and water hygiene precautions. Travellers should also take with them oral rehydration therapy and self-treatment for diarrhoea. An anti-motility agent, such as loperamide, can be carried. Information on treatment options can be found in our travellers’ diarrhoea factsheet. Malaria is not present in Medina or Makkah [Mecca] (or in the cities of Jeddah, Riyadh and Ta’if or areas of Asir province above 2,000m), but malaria is a risk in the south-western provinces of Saudi Arabia (including Asir province below 2,000m). Pilgrims planning further travel before or after Hajj or Umrah to malaria risk areas in KSA or Asia, Africa and Latin America, should seek advice about malaria prevention. Pilgrims are advised to take necessary measures to avoid mosquito bites which include sleeping in air-conditioned rooms/tents and using insect repellents . This will help protect against vector-borne diseases, such as dengue. Zika virus has not been detected in KSA [15, 16]. However, the presence of the vector mosquito (Aedes aegypti) has been recorded in KSA . MoH KSA requires that aircrafts, ships, and other means of transportation coming from countries affected with the Zika virus and/or dengue fever to submit a certificate indicating that disinfection measures have been undertaken . Minor injuries are relatively common, particularly to the feet. More serious injuries can occur as a result of stampedes as pilgrims undertake the stoning rite or other mass activities. Pilgrims are advised to avoid peak times. Elderly and infirm people, who have decided to make their pilgrimage, may wish to consider appointing a proxy for the performance of this rite. All pilgrims to Hajj and Umrah should have adequate travel health insurance. Daytime temperatures in KSA, even during the winter months, can reach over 30°C. Associated risks include sunburn, dehydration, heat exhaustion and heat stroke. MoH KSA recommends all pilgrims, especially older individuals, to avoid direct sun exposure while performing rituals and to drink sufficient amount of fluids. Countries are requested to provide education on health-related illness to their pilgrims prior to travel. Medicines with the potential to exacerbate dehydration (e.g. diuretics) or interfere with heat exchange may need adjustment by treating physicians . If possible, travel to KSA before the start of Hajj should be considered to allow a period of heat acclimatisation. Pilgrims should drink plenty of clean water (preferably bottled or boiled and cooled) to avoid dehydration. Sun protection factor (SPF) of 30 or above, with four or five star UVA protection, should be applied liberally to exposed skin every two to three hours. Male pilgrims are not allowed to cover their heads, but an umbrella will provide shade from the sun. Desert sand can reach very high temperatures, good quality footwear should be worn to avoid burning the feet. Footwear must be removed during times of prayer, to avoid losing them; pilgrims are advised to carry their shoes in a bag. During the winter months the weather can be very cold overnight. If staying in basic accommodation, pilgrims should ensure they take appropriate bedding with them such as blankets and sleeping bags. Authorities in KSA permit entry of food in small quantities in properly canned or sealed containers only . All pilgrims are advised to take personal, food and water hygiene precautions. Performing the rituals of Hajj is demanding and involves walking great distances usually in hot weather. Pilgrims should ensure that they are physically fit before travelling. Pilgrims should pack a first aid kit to help them manage relevant, common issues. Pilgrims should identify in-country healthcare resources in advance of their trip and carry emergency contact numbers for their insurance company. Further information on health risks for travellers to KSA can be found here on the Saudi Arabia Country Information page. Additional practical advice and health tips for pilgrims undertaking Hajj or Umrah is provided by MoH KSA. Pilgrims should only use antibiotics when prescribed by a certified health professional and always follow the advice as prescribed and not share or use leftover antibiotics. If pilgrims require hospitalisation within one year after returning from the Hajj, they should report their travel history and any previous hospitalisations to their healthcare provider in order to consider the possible acquisition of antimicrobial-resistant bacteria or MERSCoV.